Added all the data retrieved from the database and from application into JSON. Earlier some of the parameters like all_attempts, all_workshops etc were not included in the raw JSON and were directly rendered in the html template. But now a single variable response contains all the data. And by providing export=json as the url parameter, one can retrieve all the data in JSON. Details of package for all attempts and all workshops. Details of package for latest attempt and all workshops. Details of package for all attempts and one workshops. Details of package for latest attempt and one workshops. Count of Workshops in the list on the /view/ page. I was not following any coding standard till now. But now I have brought the code under PEP8 standards, and now it looks much better and cleaner. I also got an idea of a plot for /view/detail/ page. 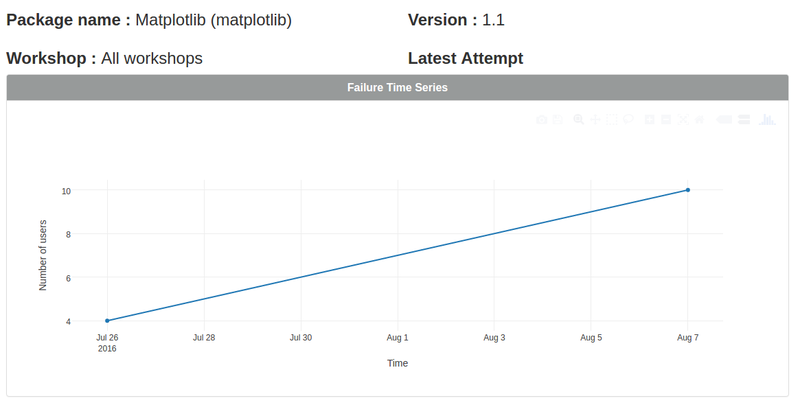 For each failed package there would be a time series plot, which would describe how much this package has been failing over the period of time. The above plot would be valid only for all workshops option. As for a single workshop, a failed package would be associated with a single date only. So I disabled this plot when details of failed package are queried only for a particular workshop. AS suggested by Raniere, I have sent an email on the mailing list of software carpentry, and have asked for the feedback of instructors and other people in the community, so that I can work on the suggested changes in the coming 2 weeks.